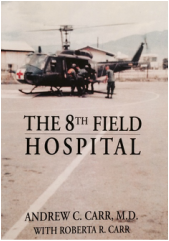 Roberta and Andy co-authored a non-fiction book called, The 8th Field Hospital, that chronicles Andy's experiences as a physician during the Vietnam war in 1966. This is not a medical book; you will find few clinical details. Instead, Andy will transport you back to 1966 through his unique perspective about the human side of war, and describe his poignant return to Vietnam in 2004. The book was published in 2005 by Trafford. To order a copy on Amazon, click here. If you'd like a signed copy, click here, provide your information, and we'll make it happen.